Year 2018 was eye-opener for investors in alternative risk-premia products. A lot of these products have been sold as market-neutral but they did not live up to expectations… I think, the reason is simple: most of ARP products have been driven by marketing with nice looking back-tested results obtained by over-fitted models. I made a presentation on this topic back in early November 2018. Yet, traditional alternatives had a bad year too. We published an article in the Hedge Fund Journal to explain the difference between traditional trend-following CTAs and Alternative Risk Premia. Here I will post the introduction and the key insight from our model to define the risk-premia alpha. The turbulence of 2018 made it a difficult year for most systematic investment products. To the surprise of several investors, many of these quant products had been sold as market neutral. In particular, the new breed of alternative risk-premia (ARP) products – that had flooded the market a few years prior to 2018 – performed exceptionally badly. For example, the composite HFR Bank Systematic Risk-premia Multi-Asset Index lost -18%, in comparison with a loss of -4% on the S&P 500 total return index. However, traditional alternative asset classes also underperformed, with the flagship HFRX Global Hedge Fund Index losing -7% and the SG Trend Index losing -8%. In the face of such losses, both investors and managers are asking how and why so many quant strategies underperformed? Still more importantly, what are the implications for the diversification of traditional equity-bond portfolios and alternative investments? In particular, since trend-following CTAs belong to a handful of tried-and-tested diversifiers, why did trend-followers not diversify in 2018? To address such questions, we first intend to look at how trend-following programs are expected to perform when crises last for extended periods of at least two months, because trend-followers need to adjust to profit from sustained crises in equity markets. Second, we shall focus on the way in which the risk profile of ARP products, hedge funds, and trend-following CTAs can change in bear and bull market regimes because of their potential exposures to tail-risk. We analyse the risk-premia alpha in these products by taking into account regime-conditional risk. 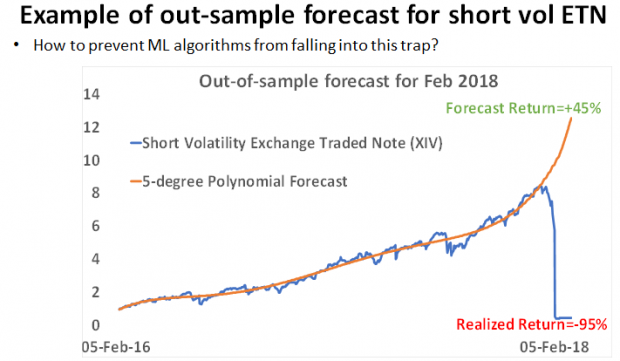 For this analysis, we are proposing a new quantitative model to explain the risk of investment strategies by accounting for extreme market conditions and for their exposure to tail risk, such as selling volatility and credit protection. 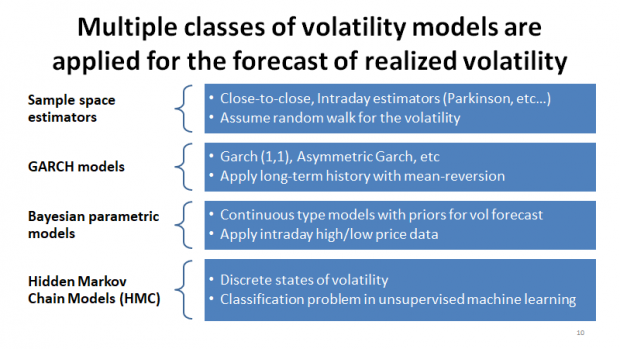 We apply this model to the cross-sectional risk attribution of about 200 composite indices of hedge funds and ARP products. We show that there is a strong linear relationship between risk-premia alpha and the tail risk of systematic ARP strategies. 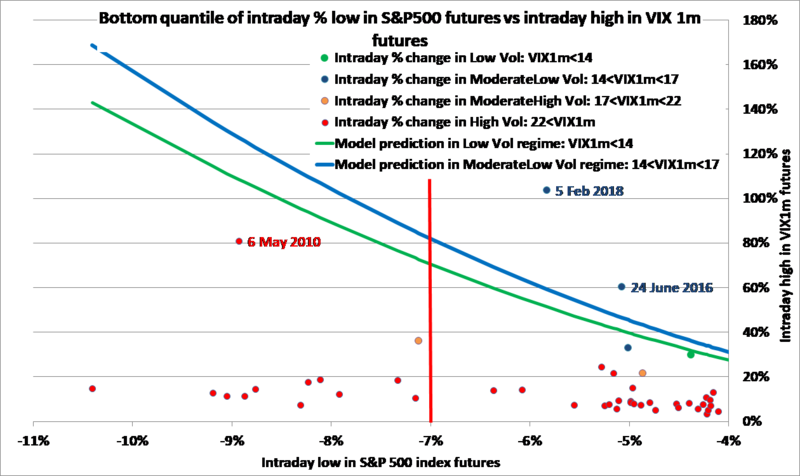 We can demonstrate that our model explains nearly 90% of the risk-premia for volatility strategies and about 35% of the risk-premia for hedge fund and ARP products. In this way, most ARP and hedge fund type products can be seen as risk-seeking strategies. Importantly, our model predicts that ARP products offer smaller risk-premia compensation compared to hedge funds. We are able to illustrate that, interestingly, trend-following CTAs are exceptions since they belong to defensive strategies with negative market betas in bear regimes, yet risk-premia alphas for CTAs are insignificant. CTAs cannot be seen either as ARP products with positive risk-premia alpha from exposures to tail risk, or as defensive products with negative risk-premia designed to reduce tail risk, such as long volatility strategies. Instead, trend-following CTAs should be viewed as an actively managed defensive strategy with the goal to deliver protective negative market betas in strongly downside markets along with risk-seeking positive market betas in strongly upside markets. Overall, after adjusting for the downside and upside betas, the risk-premia alpha of CTAs is insignificant. 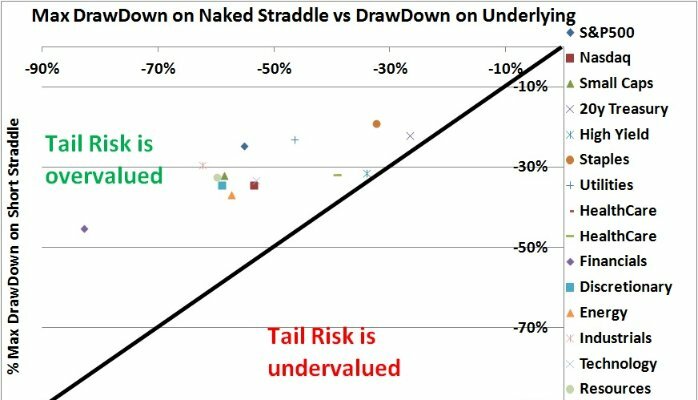 Yet, because of the negative protective betas in bear markets, trend-followers well deserve their place as diversifiers in alternative portfolios to improve risk-adjusted performance and capture risk-premia alpha on a portfolio level, as we will show in the last section. Finally, since our risk-attribution model assumes conditional equity betas in specific market regimes, we are able to illustrate the misunderstanding behind strategies claiming to be “zero-correlated” and “market-neutral”. 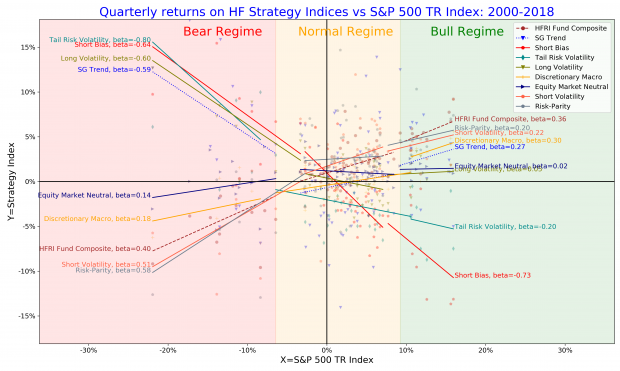 Given a specific market regime, most typically in the bear regime, many risk-premia strategies tend to produce a strong exposure to equity markets because of their hidden tail exposures. For example, a strategy selling delta-hedged put options would have a small market beta during normal regime; yet the strategy would exhibit a significant market beta during crisis periods because of its negative gamma and vega exposures. When we analyse systematic strategies unconditional to market regimes, the performance may appear to be smooth and uncorrelated because of the aggregation across different regimes. We will conclude the introductory section and our article by answering the above questions in the following way. Firstly, ARP strategies are expected to perform well during normal regimes. 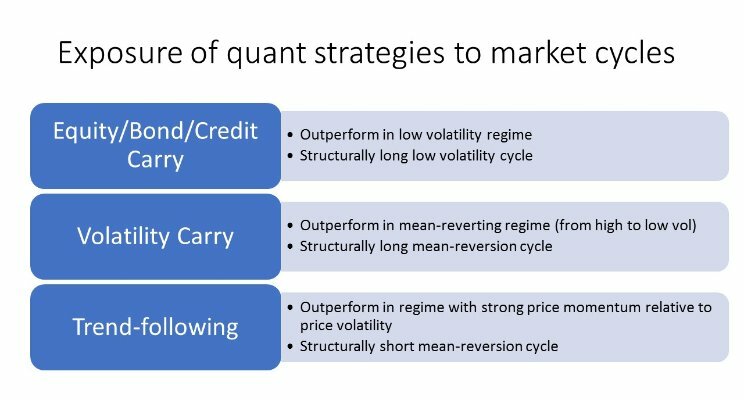 However, since the excess performance of these strategies is derived from a hidden tail risk, these strategies are expected to underperform during turbulent markets, as in 2018. To earn risk-adjusted alpha from these products, investors need to look at long time horizons that include both bull and bear markets. 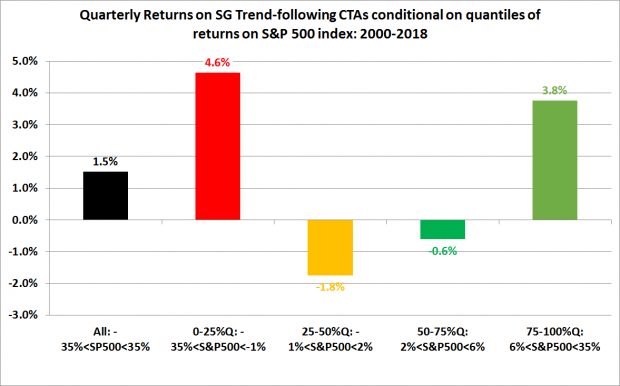 Second, while the performance of trend-following CTAs is not derived from risk-premia alpha as compensation for hidden tail risks, the performance of trend-followers is conditional on trends lasting for sustained periods. Since trends reversed rapidly multiple times during 2018, trend-followers underperformed. As a result, in what proved to be an extraordinary year, both ARP products and trend-followers underperformed, but for different reasons. Going forward, investors and allocators need to understand how different strategies are expected to perform during bear and normal markets and how to diversify their portfolios accordingly. Our results provide a valuable aid in quantifying the hidden tail behaviour of systematic strategies as well as suggesting an approach for the risk attribution and diversification of alternative portfolios. Risk-premia alpha measures the excess return on a strategy after adjusting for conditional beta exposures. According to the regime conditional CAPM, a strategy should produce higher risk-premia alpha if it assumes higher equity risk in a bear market measured by marginal bear market betas. ARP indices using HFR Bank Systematic Risk-premia Indices with a total of 38 indices. According to our model we see a clrear differentiation among risk-seeking strategies, defensive strategies and trend-following CTAs. Risk-seeking strategies: the marginal bear beta is positive (increased risk in bear regime) compensated by positive risk-premia alpha. Most hedge fund and ARP products are risk-seeking strategies with tail risk. 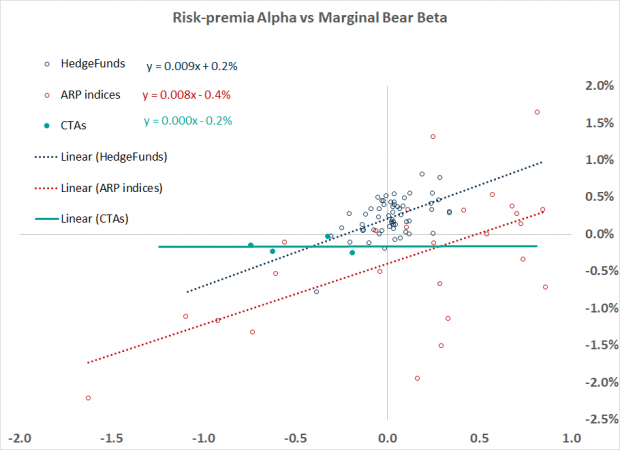 We observe almost a linear relationship between risk-premia alpha and marginal bear betas for the cross-section of hedge funds and ARP indices. 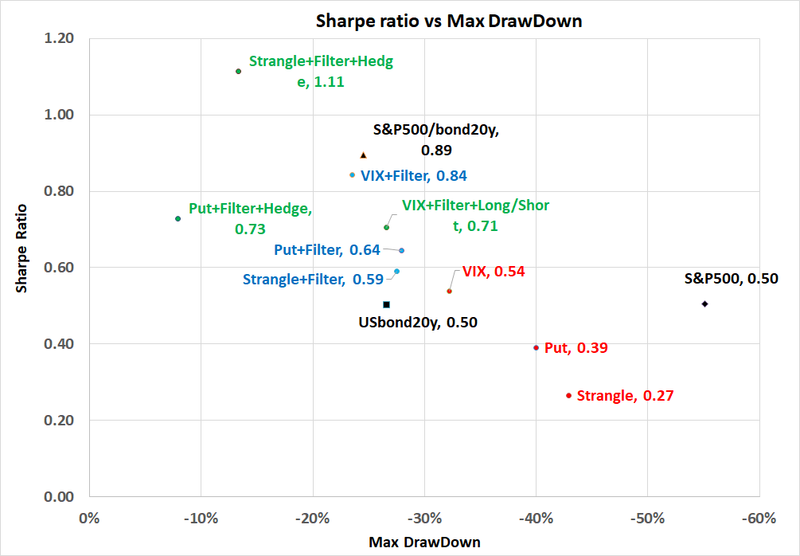 ARP products deliver less risk-premia alpha for the same level of tail risk compared to hedge funds. Defensive strategies: the marginal bear beta is negative (reduced risk in bear regime) compensated by negative risk-premia alpha. Defensive strategies diversify equity risk in bear regimes but deliver negative risk-premia alpha. Trend-following CTAs: produce negative marginal bear market betas and hence strongly diversify equity risk in bear market regimes. Because their risk-premia alpha is flat, trend-followers can be considered as an anomaly, or as a differentiation from ARP and traditional hedge fund products. “Today a new language is overtaking French as the most popular language taught in primary school. Its name is Python… 6 out of 10 parents want their kids to learn Python”, Joel Clark. Well, when I attended school, I learnt BASIC… But I must confess, I do share the excitement taking over the Python language. Why Python has become an increasingly popular programming language in financial markets? One of the major advantages of using Python is the ease to interconnect different systems with data feeds and databases, to process data, and to output results into user and trading applications. My first experience with Python came in 2012, when Bank of America Merrill Lynch, where I worked as a front office quant strategist, introduced the Quartz system developed in Python. The Quartz was supposed to be the bank-wide solution to share data and trading risks. The reason is that the insufficient centralization and aggregation of positions and risks across all trading books (traditionally differentiated by geographies and asset classes) was one of the key weaknesses shared by large investment banks during and in the aftermath of the 2008 financial crisis. As a result, the Quartz and Python-based analytics were thought as a bridge to connect different parts of analytics, data centres, and development teams. A daunting task for any large organization employing hundreds of developers and users! Moving fast forward, Python has been widely applied by major financial institutions for developing tools to connect different parts of analytics and to increase collaboration within a firm. Over time, people have also started to do more core development in Python in addition to using Python as a glue language. 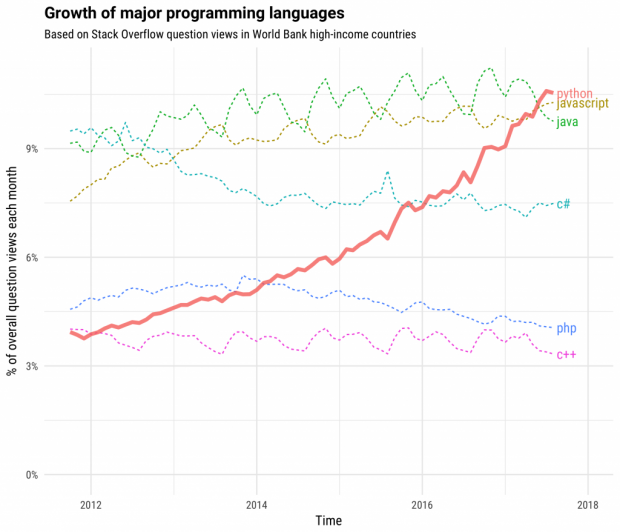 New developments using the Python language have been leveraged thanks to a rich Python ecosystem with huge number of libraries for data analytics and visualization. For an example, Man AHL illustrated how they benefited by moving both research and production code to Python. Python enhances the communication between different teams. Python provides an advanced ecosystem with packages for numerical and statistical analysis, data handling and visualization. Python is easy to learn and it is flexible to apply, and it’s actually fun to program using the Python language. As a person with many years of doing quantitative modelling in C++ and Matlab, I fully support this view. How Python works among other languages for data analysis? Since data analytics is currently one of the key drivers across all industries including the finance and investment management, choosing the right ecosystem for development may have a crucial impact on the business development and success. Presently, the three development tools are widely applied for the data analytics. Python along with pandas for tabular data structures and multiple packages for data analysis (statsmodels for statistical analysis, matplotlib for data visualization, scikit-learn for machine learning, etc). The advantage is that Python provides a free and open-source solution with plentiful resources for data fetching, processing, and visualization. Python can be easily deployed on either a PC or a server to make scalable firm-wide solutions. Traditionally, Matlab has been widely applied in academic and research labs but it comes with a heavy cost for commercial firms. Matlab has numerous packages for data processing, analysis, and visualization, however each package is available at a separate price. Personally, I have used Matlab a lot along with its capabilities for the object-oriented programming. While I value some capabilities of Matlab, the major drawback of Matlab, apart from its licensing cost, is that the deployment of Matlab-based analytics is problematic and comes with separate fees. Matlab applications can be compiled and deployed on a server but the deployment process looks complex and not well documented and it may be costly if external consultancy is needed. In my opinion, the insufficient portability and scalability are major obstacles for developing firm-wide solutions using Matlab. R along with its multiple packages for statistical data analytics. While R is free and it has many packages to do various statistical analyses, the deployment of R across firm-wide platform may not be as efficient. In my opinion, the R language is suitable only for the development of stand-alone tools for statistical analyses. In fact, Jupiter Lab enables to apply R functionality within the Python ecosystem. How long would it take to convert Matlab production code to Python? Given the advantages of Python over Matlab, most firms would now employ Python to start any new development from scratch. How is about converting the legacy code and systems? Gary Collier gave one example of AHL converting a fairly complicated trading system for single stock equities to Python within 8-9 months. In fact, my friend Saeed Amen has just written a short overview paper on moving from Matlab to Python. The transition is feasible… While there will be short-term costs, the long-term benefit is to have a firm-wide solution developed in one multi-purpose language that everyone can understand and contribute to.